Ahead of Australian Open 2016, a look at the nomadic history of the Grand Slam and it's evolution from grass courts in various cities to its current home in Melbourne Park, with Rod Laver arena, Margaret Court Arena and more. The Australian Open enjoys over 100 years of history, but less than a third of that nostalgia rests at Melbourne Park, where the Grand Slam tournament is currently held and has lived since 1988. The early years of the Open moved around Australia—and even New Zealand—and then found a grass-laden home near Melbourne, before its final move to the park. With the popularity of the grass-court tennis of Wimbledon paving the way, the Australasian Championships debuted in 1905 and was held on grass courts. During the early decades, the tournament moved between major Australian cities and even made stops in New Zealand twice. The original 1905 event took place in Melbourne at what later became known as the Albert Reserve Tennis Centre, now the official training grounds for Tennis Australia. In 1906, Christchurch, New Zealand, hosted the event, followed by several jumps between Brisbane, Sydney, Perth, Adelaide, and Hastings, New Zealand. Back in Sydney at White City Stadium in 1922, the tournament added a women and two years later it was designated as major championship. 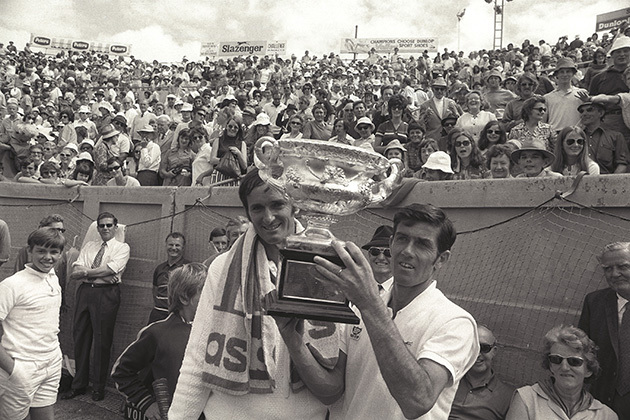 While Sydney hosted the tournament 17 times and Adelaide 14 times, by the 1970s it became clear Melbourne was the home of the Australian Open. As Melbourne native Gerald Patterson took home Wimbledon singles victories in 1919 and 1922, the interest in tennis prompted the construction of a 17-acre site in a Melbourne suburb. The creation of 20 lawn courts, a clubhouse and an 8,500-seat concrete stadium shaped the Kooyong Lawn Tennis Club, host of the first Australian Championship in 1927. The Kooyong grass courts grew in use on the international stage. Kooyong hosted a variety of Davis Cup ties and eventually became the first permanent home for the Australian Open in 1972. The center court venue was the only stadium on the site and with a desire by Tennis Australia to grow attendance of their tournament, plans formed to create Melbourne Park—it was originally dubbed Flinders Park—as the new permanent home of the Open in 1988. The Australian Open moved to its new location in 1988 with an entire plan of stadiums and courts designed by architect Peter Brook and firm Peddle Thorp Learmonth, according to information provided by Tennis Australia. The signature of the National Tennis Centre’s creation just outside of Melbourne’s Central Business District was a 14,820-seat center court with a 700-tonne retractable roof (the court was named Rod Laver Arena in 2000), a 6,000-seat Match Court 1, a 3,000-seat Match Court 2, 13 outside match courts, five indoor practice courts and fan amenities. The retractable roof was a world’s first with two rolling sections, each spanning the court with arched trusses for a distinct visual element. The roof not only kept the heat at bay during the Open, but also the cold out during concert season. During that first year, the new center welcomed over 266,000 fans, doubling the attendance the previous year at Kooyong. 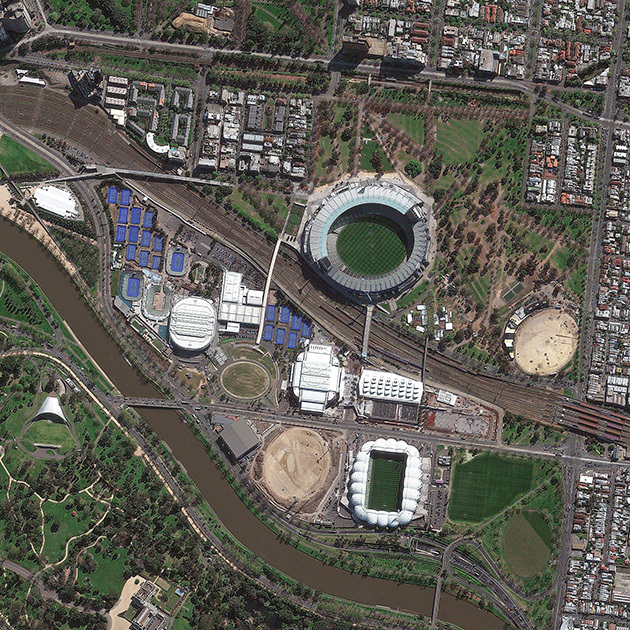 An aerial view of Melbourne Park. In 1996, the Australian Open roughly doubled in size at Melbourne Park with more public spaces, parking and the addition of two new show courts—one for 3,000 fans and one for 800—and eight additional outdoor match courts. But it was 2001 that saw the next major addition, with Vodafone Arena—now known as Hisense Arena—opening with a retractable roof, a larger floor area than Rod Laver Arena for non-tennis events and a steeper seating rake to allow the 10,500 patrons inside the indoor facility to feel closer to the court. A renovation that opened in time for the 2015 event gave Melbourne Park its third major indoor option, the only Grand Slam event with three retractable-roof venues. Match Court 1, which had fluctuated from the original 6,000 seats down to as few as 5,000 seats, was renamed Margaret Court Arena in 2003 and then overhauled before 2015 with a fashionable retractable roof and additional seating that pushed capacity to 7,500.